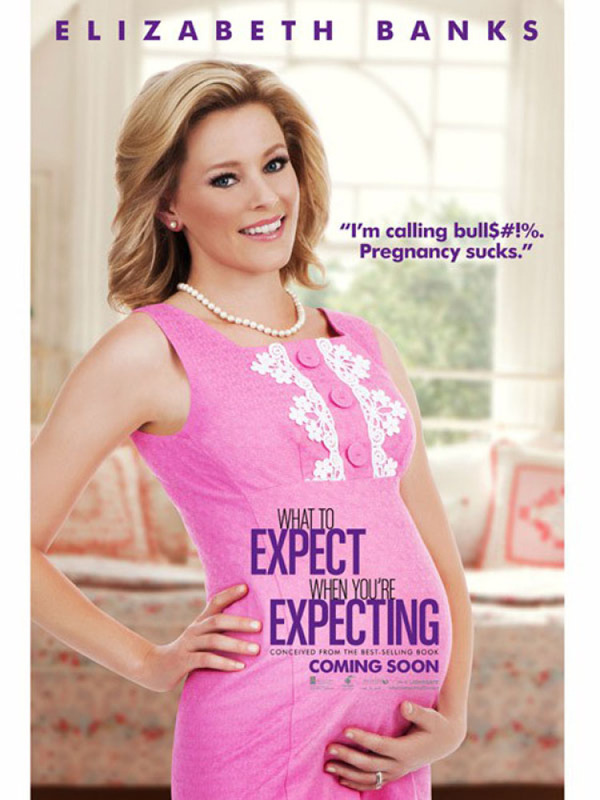 I have a theory about What To Expect When You’re Expecting, which hits theaters in May. It is just like New Year’s Eve or Valentine’s Day (hello, ensemble casts) except it is a far more humiliating movie for all of the actresses involved. The character posters for What To Expect When You’re Expecting don’t do any of these theoretically talented women any favors. (Sorry. I won’t accept this idea that Brooklyn Decker is an actress.) The posters play into terrible stereotypes, recycle the bad jokes about pregnancy, and are just embarrassing for everyone involved. Especially us. We have to look at them. Of course there is a joke about how good your rack looks when you’re pregnant. This poster is hinting at the fact that Jules got “knocked up” unexpectedly. Actually, I know this is true because Matthew Morrison said in some interview recently that he is the baby daddy. I’ll wait while you laugh at the thought of Matthew Morrison impregnating Cameron Diaz. On Wikipedia, Wendy is described as “”author and owner of The Breast Choice boutique who is militant in her beliefs about what makes a good mother until she gets pregnant for the first time.” If this character is not a blatant parody of Megyn “I Love Maternity Leave” Kelly, then she serves no purpose. Wikipedia tells me that Skyler is married to a much older man, who is played by Dennis Quaid. Of course she is. I bet his children from his first marriage hate her and her crazy horniness causes her older husband to have a heart attack. And since when is Brooklyn Decker famous enough to get her own character poster? Reminding us that Andy Roddick used to be a tennis player doesn’t make her a movie star. Since this is a movie about pregnancy, there has to be a barren woman who is fixated on adopting a baby. Holly is so obsessed with adoption, she doesn’t realize that her husband isn’t ready for a child. But she’ll plow through and adopt as a single mother so the audience can feel less sorry for her. I mean, look at this poster. Her empty womb makes us feel bad for Holly because not being able to carry a child of your own is a woman’s greatest failure. That and if you give birth Kevin from We Need To Talk About Kevin. It’s always the woman’s fault. Oh man. These posters are horrendous. I can’t even pick which one is the worst. Can’t wait to not see this movie. The sad thing is I could be swayed paid off to see it. And I would consider this my gift to America. The posters are awful. Come on CamDi. You can star in a good movie again. You can be a good actress.